If you’ve been a regular reader of my blog then you probably know how high I place the importance of learning wilderness survival skills. Being proficient at these skills provides the ultimate backup plan in a worst-case scenario where you’re left with only the gear on your back and your wits. In my opinion, to truly become proficient at wilderness survival, you need to go out in the bush for at least 3-days; and go on these trips multiple times. It’s the first three days that are often the most difficult and really present you with the various challenges and difficulties that arise in a wilderness-survival situation. On a 3-day trip your forced to build a shelter that keeps you dry and warm, collect and purify water, make a fire, and start finding food. A simple overnight will not provide this experience since you can last the night without water, fire, food, and sometimes even shelter. When you are doing Progressive Backyard Survival, you’ll be practicing all of the major aspects of a survival situation: Shelter, Water, Fire and Food. But instead of it being covered in one extended survival trip, it will be broken up into smaller time frames over an extended period like a month for example. Basically you fit it to your schedule and available time. It may take longer, but you’re still learning the necessary skills if you follow the process correctly. It’s important that each step is performed to completion before you attempt the next step. 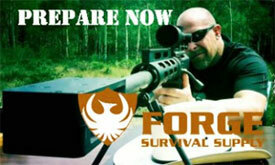 This will make it comparable to the steps you’d follow if you were in a survival situation. Take as much time as needed to finish each step before going on to the next one. The first thing you’ll want to do is pick a spot where you’ll be practicing. Ideally this would be a place that is near your home, is accessible during both the day and night, and has the resources you need to practice the various survival skills. This will be your training ground. Even if you can’t find a spot near your home, do not get discouraged. Your own backyard can be a great substitute. If you decide upon your backyard, for some of the exercises you’ll just need to bring the materials from other locations home with you. Whether you live in an arid, temperate, or cold environment, exposure is often the first cause of death for those caught in a wilderness-survival situation. For this reason, shelter will be the first step you perform. If you’re new to wilderness survival, this step would be simply building a tent or setting up a tarp shelter. As you get comfortable with that you’ll want to move on to making a primitive shelter. Since I cannot cover every shelter for every area of the globe, you’ll need to do some research in determining what type of shelter is best for your environment. The key factors are that it keeps you protected from the elements (dry when wet, shaded when hot, warm when cold, etc). For example, I live in the Northeast — a place that abounds in trees and forest debris. 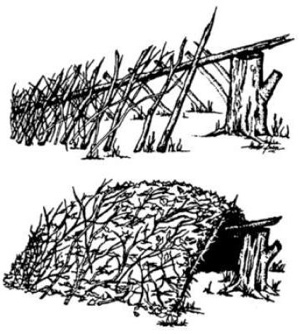 My shelter of choice out here is the debris hut which is basically a framework of sticks that is stuffed inside and out with leaves or other natural debris for insulation. This will keep me both dry and warm without the need of a tarp or sleeping bag. Once you’ve chosen your shelter, start building it. Again, this could be in one sitting (like setting up a tent) or if it requires normally an hour or two to build (like a primitive shelter) you can spread this over a few days as you have time available. If you’re using your backyard and have the materials near you, use them. Otherwise you may need to bring them in from an outside location. Knowing how to build the shelter is only half of the process. Sleeping in a shelter you built is really the best teacher. It will teach you to overcome the fear of being alone, the dark, as well as sleeping in something other than your bed. In the case of a primitive shelter, it teaches you how best to insulate it, where to build it, what materials to use and so on. Now that you’ve tried it for a night, make the improvements to the shelter and when you have time, try it again. If you used a tent, this part might include buying a better sleeping bag or realizing you need to use a ground mat and so on. Remember, do not continue to the next step until you’ve finished the shelter section. Dehydration is a major concern in not just arid environments but in cold environments as well. Since most publications say we cannot go for much longer than 3 days without water, this will be the next skill you will practice. The first part of this step is to find a source of water. This could be morning dew (in which case it is already purified), ice or snow, a body of water, a dried out river bed, setting up a solar still and so on. Once you’ve found your water source, you’ll want to practice different means of collecting it such as soaking it up with a cotton shirt, long grasses, discarded bottles or cans that you find lying around and so on. In the beginning, use your own containers and as your skill grows you can practice making your own or finding field expedient ones. Fire making is one of the most popular skills that people practice, and for good reason. Fire increases moral, keeps us warm, cooks our food and purifies our water. In a primitive survival situation it helps us to make tools and crafts which are used in so many other survival applications. For this step you’ll want to practice setting up and building a complete fire from scratch. Again, if you’re a newbie, this step might be using matches or a lighter with some Vaseline-soaked cotton balls. 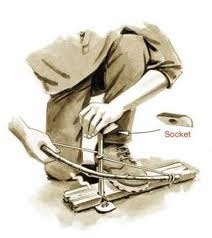 As your skills progresses try using a firesteel or flint and steel or for even more of a challenge try a primitive fire-making skill like the bowdrill, handdrill or fire saw. In order to complete this step, you’ll need to get a fully mature fire going. That is, one that has burned long and strong enough to produce coals that you can cook on, purify your water from, and make other tools (if you’re practicing primitive survival). Most of the time you spend doing Progressive Backyard Survival is taken up in this step. If you’re a beginner, you’ll skip finding food and just practice outdoor food preparation and cooking over a fire. For everyone else, you’ll practice gathering and preparing wild edibles, procuring meat through trapping, fishing, hunting and so on. It also includes gutting, skinning, cleaning and preparing the animal, cooking it, and of course, eating it. 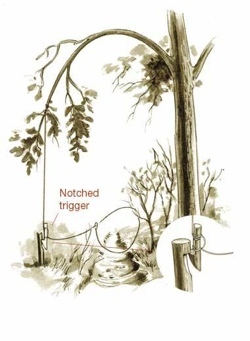 Using a trapping example, you might spend an hour one day buying or making a set of snares or building primitive traps. Then when you have some time, you’ll set them up (be sure you have the necessary permits) and check on them regularly to see if you caught anything. If you don’t succeed, take note of any improvements you can make (different bait, different location etc) and make those changes the next time you have availability. When you do catch or hunt something, you’ll be practicing skinning, cleaning, and preparing the animal to be eaten. Since you’ve already made fire on a previous day, for this step you can simply cook it in your home, or if you have time, set up a fire outside and cook it that way. Although a lot of time can be spent on this step, to complete a Progressive Backyard Survival session you’ll want to have procured (skip this if newbie), prepared, and eaten at least one meal (be it plant or animal). 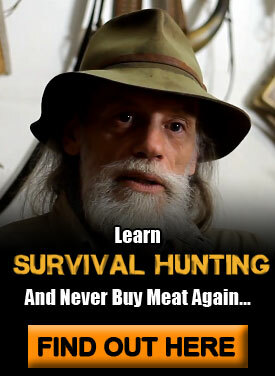 This progressive survival training process is perfect for those with limited time. Although the time is more spread out than say a 3-day survival trip, you will learn the same skills and perform them in the same order as you would if you were out there for those 3 days. It may take longer but you are still learning the skills and getting experience. You can also add other steps if you want such as signaling for rescue or navigation to get yourself home. There are also many other applications. Although the steps may be different than for wilderness survival situation, this step-by-step progressive process can be applied to other types of survival situations. For example, you could apply it to an urban survival situation where you’re caught in a city, a shelter-in-place situation where you’re in your home without utilities, or a bug-out situation where you’re on the go. 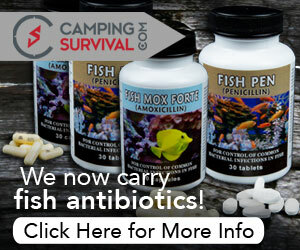 Hi, the url above was one that was built for me which also contained a Blog http://surburbansurvivalblog.us/ I can change the blog posts and the main site I can add Survival products and i’m not happy with the links on water. Having read about your water in step 3 do you think that by purchasing the units [usually over $100] that say you can use foul water and water basically from any source, is a better way of having an emergency water with you, this way you only have to have one item to carry. Your ideas are simple and great, I could imagine a Mum, Dad and a couple of Kids have a great time. One step at a time as a weekend camp outing.